Reuters Magazine ‘Foreign Affairs’ (as well the UK’s Financial Times) headlines this week what thegoldwater.com reported 3.5 months ago already, but what most then saw as a fluke. 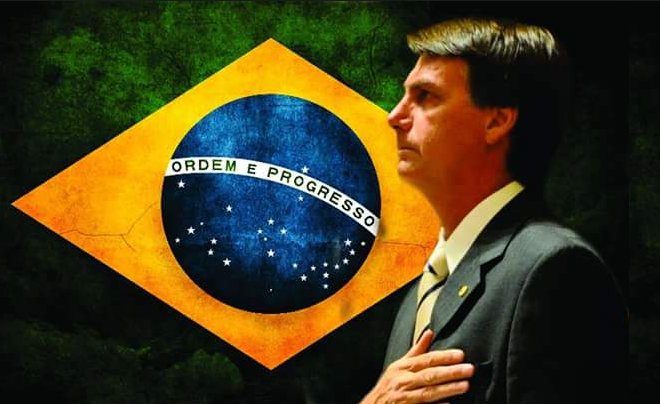 The candidate for the far-right, Mr Jair Bolsonaro is still leading the polls of South America’s biggest nation with now only 3 months to go till voters head to the polls. Many are starting to seriously consider Mr Bolsonaro might have a chance. Mr Bolsonaro’s growth in popularity has been impressive and steady. Using social media and the general disgust of the Brazilians with today’s political class, he has seen his poll numbers rise from five percent in July 2016 to around 20 percent today. Whereas most experts agreed in the spring of 2018 that his lead in the polls was a probable fluke due to his record which favors radical positions on various social topics and his history as an apologist for military dictatorship and torture, young people in Brazil seem more and more convinced that the only way to deal with the growing problem of criminality in corruption in the biggest South American country would be some form of return to a military style dictatorship as they’ve had in the 1970s and 1980s. Under a guise of ‘it can’t get worse so why not try it’, a growing group of youngsters decides to go for something new and Mr Bolsonaro has softened his image a bit in recent weeks, making him even more likable to his probable voters. Many in the political and business classes of Brazil now admit that he could be a possible dark-horse candidate, some sort of populist outsider whose anti-establishment rhetoric could deliver a victory in October. Ms Lyudmila Okuneva, professor at the University of International Relations in Moscow interviewed for BRICS magazine, explained that the current political class in Brazil is “afraid of Bolsonaro, because the ‘injection’ of the military regime was more than strong after the military spent 21 years in power.”. According to professor Okuneva, the reason for his lead is because ever since the multiple corruption scandals of the past presidents, there is no single candidate of the center. I was recently watching a video of Jim Watkins do yoga with a monkey faced Filipino prostitute. Looking at Jim's T-shirt, it was obvious that he was wearing a girdle contraption underneath. And on the far right of his chest, he had a bizarre huge breast. On the far left side of his chest, there was yet another bizarre huge breast. Jim Watkins has the most disgusting case of gynecomastia I've ever seen.